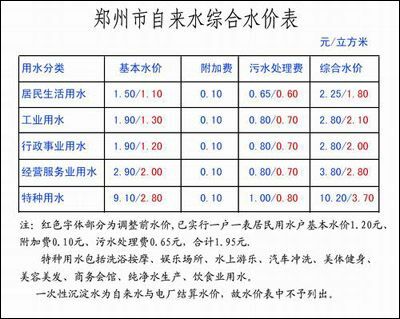 The basis concerns give an official, this the price adjusts Zhengzhou town tap water to basically include dweller life to use water, industrial career of water, administration uses line of business of water, management service to use water and one-time precipitation water with water, special type 6 kinds big use, specific adjust a standard to see subordinate list. RMHl=o; . It is beyond urban building area, the place that the net did not reach communal feed pipe takes the city to use water door with the well of provide for oneself of groundwater, collect a standard to be: (1) dweller life is used water, industrial water, every stere 0.7 yuan. (2) administrative career uses water with line of business of water, management service, every stere 1 yuan. (3) special type industry uses water, every stere 4 yuan. (4) ground temperature air conditioning uses water, every stere 0.05 yuan.